Simon tests the Open One 3L bib and jacket. There’s a term you hear in business school called Red vs. Blue Ocean Market Strategy. It basically separates markets and respective strategies into two categories; a red ocean indicates it’s shark-infested and bloody, a market in which many suppliers are fighting over a similar customer base, while blue oceans imply there is room for expansion and growth without being shredded by other sharks, i.e. the competition. 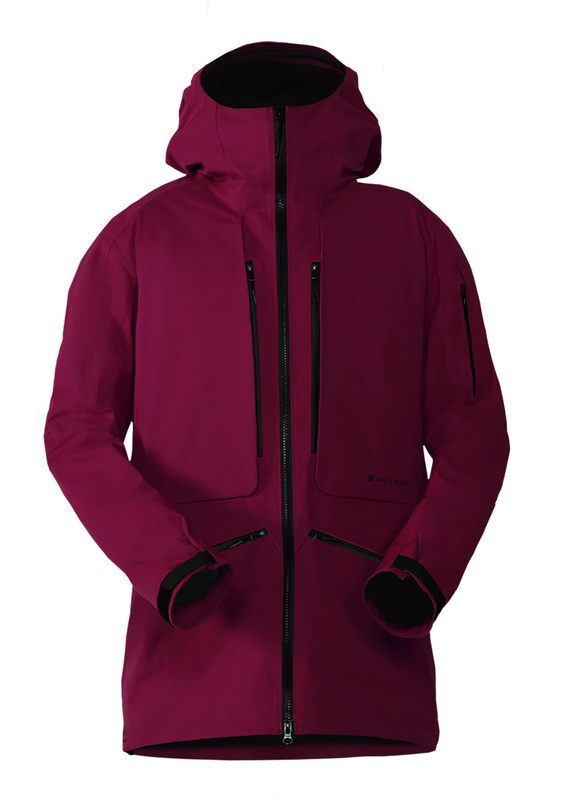 The outerwear market nowadays could not be any bloodier, with countless players trying to lure in a somewhat limited customer base, which is why I sometimes find it a bit difficult to get excited for new brands within the snow industry. Especially when it comes to skis (seriously, at this point, why?) and outerwear (you know something we don’t already?). However, the specs for this outerwear combo from startup Open Wear are certainly eye-catching! 45K waterproofing is no joke, and Open Wear’s top line comes with all the bells and whistles to get serious in the mountains. At half the price of what you’d pay for comparable items on the market, the price tag is simply ridiculous. To top it off, Martijn & Chris, founders of Open Wear, claim to have a truly sustainable company in place, with products that can stand the test of time on this oh so maltreated and vulnerable planet. Sounds cool, and knowing Martijn for a few years now, I was definitely intrigued enough to get my hands on the stuff and give it a test. A bunch of touring missions and a weekend on a secluded mountain hut later, I’m comfortable writing a few words about the setup. The author putting Open Wear to the test. Unpacking, the gear feels high-quality and sturdy, very reassuring. The 3L Sympatex shell is a bit softer than comparable Gore-Tex materials, which can make you wonder where the high waterproof rating stems from, but you definitely get the feeling of holding the real deal in your hands. The manufacturing is precise and ultra-clean, all seams are fully taped and especially the long YKK zippers are perfectly integrated and durable. And zippers there are—these things have pockets and vents for days. Bibs can be kind of tricky fit-wise, as you obviously don’t tie them around your hips with a belt. 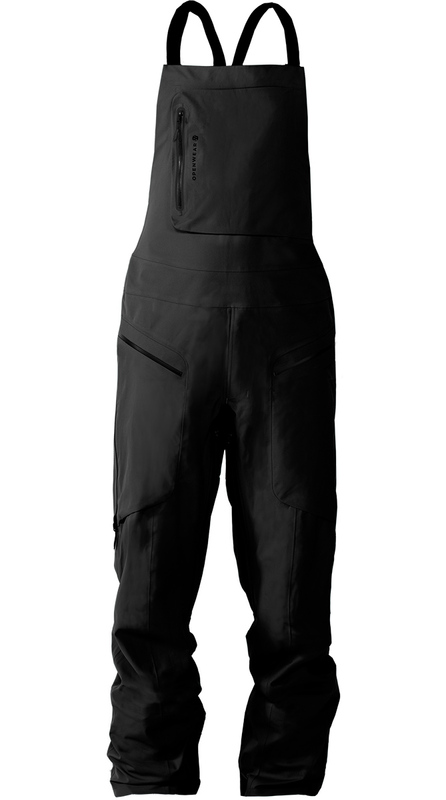 Open Wear’s edition of the classic bib (yup, with the mandatory kangaroo pocket) is fitted rather tight around the hips to make sure you’re not carrying around a pair of leg-tubes on your shoulders alone. Zippers on both sides allow you to open the back of the pants, making it easy to get in and out even when wearing a few layers. Two buttons and adjustable suspenders ensure the perfect fit once you’re zipped in. Sweet! One of the main reasons for me to test these pants was the double vent system—Martijn assured me he was also on the “sweat-like-a-mofo team” while touring, and this could be the solution. Being able to open the legs on both sides during the hike up is a great feature—unless you want to go commando, more venting is literally impossible. I still get warm and the bib seals in some heat in the core area, but this is probably as good as it can get. Be sure to close all vents in rougher conditions though, as there are no mesh-guards to prevent snow from coming in. I already mentioned the kangaroo pocket, which is great for holding a quick snack or your MP3 player. There are four additional pockets, two in the back and two in the front, all with fully water-resistant zippers to store your goods safely. The front pockets are huge and can easily fit your gloves, for example. They are a bit too long even, making it uncomfortable to carry a cell-phone or a can of snus (oops) and retrieving smaller items from them. However, this doesn’t take away from the overall appearance and functionality of this well-conceived product. The material is incredible and places both products in the heavy-duty realm. Impenetrable by snow and water, it kept me warm and dry during rainy conditions in the valley and ice-cold winds on the peak, making it a perfect companion in all conditions. The high functionality and attention to detail continues in the Open One jacket. Two ultra-long vent zippers under the sleeves allow for air conditioning in warm conditions and supposedly during hikes, while the same 45M shell keeps all weather conditions out. Maybe it’s just me, but I simply can’t hike for very long wearing a 3L shell made of plastic. It’s too warm. Don’t think that’s such a bad thing though, who loves hiking in the rain anyways? The Cohaesive cord adjustment system allows for one-handed adjustments of the hood and hem, without removing your gloves. 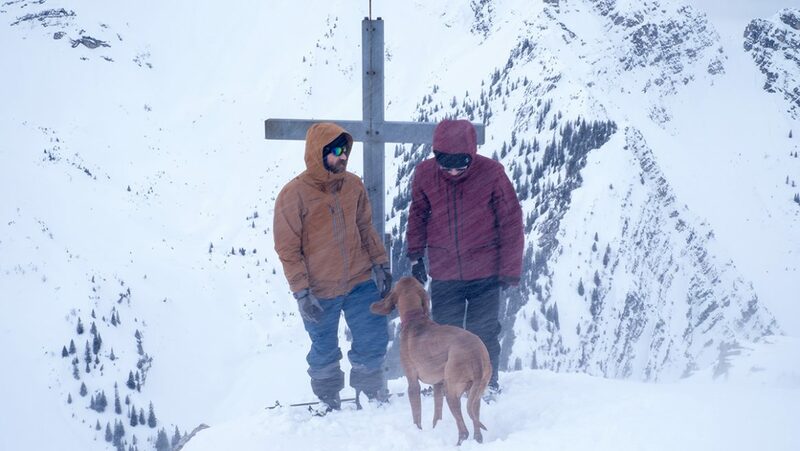 It’s the simple things that make your everyday life on the mountain better. 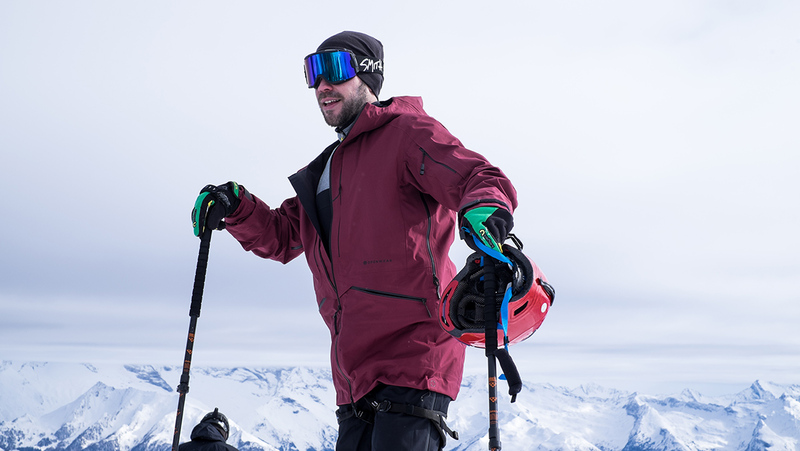 Long story short, the Open One 3L Shell Bib and 3L Shell Jacket make for one hell of a combo to own. The functionality is off the charts and the fact that it all comes from 100% recycled materials and remains 100% recyclable, produced under ethical and fair working conditions in a state-of-the-art, green working environment, makes it that much better and more desirable. The good people at Open Wear designed their products with one simple intention: at the very least they wanted to be able to look their customers straight in the eyes while telling them what, where, and how they produce their gear. After a wildly successful Kickstarter campaign, they’re now in their second season and are looking at strong sales numbers and high demand for a truly innovative product. Hats off to you, gentlemen, way to fight off the sharks and steering towards open waters! You can read more about the production of all Open Wear products in Vietnam here, and we have provided a few very interesting insights from company co-founder Martijn for you below. How long had you been in the industry before you started working on this project and what made you think it could be successful? I started “working” in the snow industry in 2011, when I spent two seasons in Laax, Switzerland. Immediately after I returned to the Netherlands, I started working for Protest Sportswear. (One of my first jobs there was to add skiing to the sports by setting up a video contest with Downdays). Soon after, I became Head of Marketing at Protest, but in the summer of 2015 I decided to move back to the mountains. This was about the moment when I started working on Open Wear. After one of my first ski tours, I knew I needed new proper, highly technical gear. I just didn’t want to pay €2,000 for the full set. That’s how the direct-to-consumer business model came to fruition. I got in touch with Chris and together we improved the idea, followed our hearts and decided to turn it into a transparent, fully sustainable brand. What are Open Wear’s core competencies? Can you give us three aspects that separate you from the rest? 1) We believe that the consumers are ready for more sustainable, high quality products. 2) We try to make our products more affordable by changing the business model and selling directly through our website. 3) Last but not least, we believe in full transparency. We started Open Wear with the idea that in the worst case scenario, we’d made a bunch of nice products for our close friends and family. Keeping this in mind, we wanted to be 100% sure that we could look everyone right in the eye and explain how, where and why we produced our products. We don’t want to spend big on marketing, explaining how great or sustainable we are. We believe it’s not up to us to decide about this. All we can do is open up about what we do and let others decide if it’s good or not. This way, we know exactly where to continue and where to improve. Is 100% sustainability even possible in this day and age if you want to be competitive? 100% sustainability is not possible if you produce anything at all. No matter how competitive you plan on being. It’s one of the things we found the hardest to get right. Sustainability has a lot of aspects and one decision in the beginning of the process can have a big impact further down the line. We are trying to make the best choices in the market. Explaining it to everyone, staying open for feedback, and staying on top of the latest innovations that can improve our sustainability. Unfortunately, too many companies tackle one little aspect, call it bio, eco or sustainable because they believe it sells their products better or suits their image, but in the end they are not really aiming on changing anything at all. It’s really not as simple as you might think. The old retail model involves many different stakeholders and decision makers, and as soon as one party puts price above sustainability, most of the best ideas get killed. 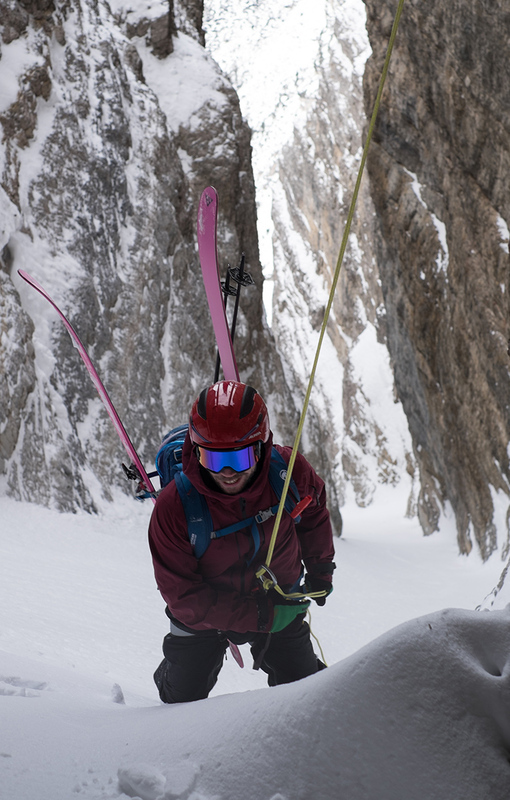 By going direct to consumer, we “only” have to find likeminded skiers that are interested in buying our products. One positive aspect of sustainability is that it often fits very well to longterm business strategies. Setting up a business sustainably often has some very positive efficiency side effects. Besides ethical production and using the right fabrics, what can you do to drive sustainability? Sustainability is not only in the production process alone. Delivering a sustainable product also means setting up a repair, re-use and recycling program. Landfills all around the world are filled up with clothing that could have easily been reused or recycled. To do this properly, however, you already need to take this purpose into account from the very first moment you start selecting materials and designing your products. In the upcoming months we’ll be launching a repair and re-use program, where you can return your used Open Wear product. We will check it, repair it if necessary, clean it and make sure that the next person has a perfect product again—all arranged over our website. A fun fact will be that you can follow your product in the future, as all have unique serial numbers. So you really know what happens with it, even after you stopped charging through deep powder with it. You just won an ISPO Gold Award and built an award-winning website. Is it safe to say business is going well and you’ve made it over the first start-up hump? Yes, both were great recognitions of what we’ve been trying to built over the past year. Business is going good and we could not have dreamed of being here when we started this journey almost two years ago. However, each new phase brings new hurdles and we are still a few steps away from being a key player in the market. For us it’s very motivating to receive great feedback from our community, and with their trust I’m sure we can push the brand forward and step-by-step push the entire industry towards a more sustainable approach. I really believe that most people in the industry, deep in their hearts, would love to do so. We hope that our little bit of success helps create some bases of support within other companies as well.